Top level professional computer services & repair for business and home users in Royse City and the close-in surrounding areas. For businesses today, if your computer or computer systems go down you start losing money right away; or, if your systems are running poorly productivity can suffer. CrossCreek Services is committed to getting you back up and running as quickly as possible. Businesses strive to make the best use of their assets which may not include a fulltime IT person. Maximize your resources by having a fully qualified IT person only when you need them. We at CrossCreek Services are your “go to” people for all your business computing needs. With our years of experience, superior customer service and very reasonable pricing, we can keep your downtime to a minimum and your productivity up. Give us a call today. Remediation of all manner of Malware and compromised systems. Diagnose and remedy unstable systems due to misconfiguration, hardware and software issues. Network services including secure Wi-Fi setup, file sharing, printer sharing and secure work groups. 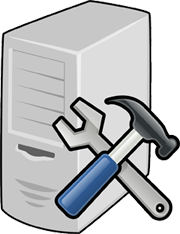 Hardware upgrades and repair including memory upgrades, hard drive upgrades or additions, data recovery, data archiving and other general hardware issues. System tuning for peak performance. Other services not listed, give us a call today. © 2015 Cross Creek Computer Services. All rights reserved.